Yonkers native Hector Santiago is going to change the world… one handshake at a time. That and become the Mayor by the time he is 35. Oh, and he also wants to do a TED Talk. 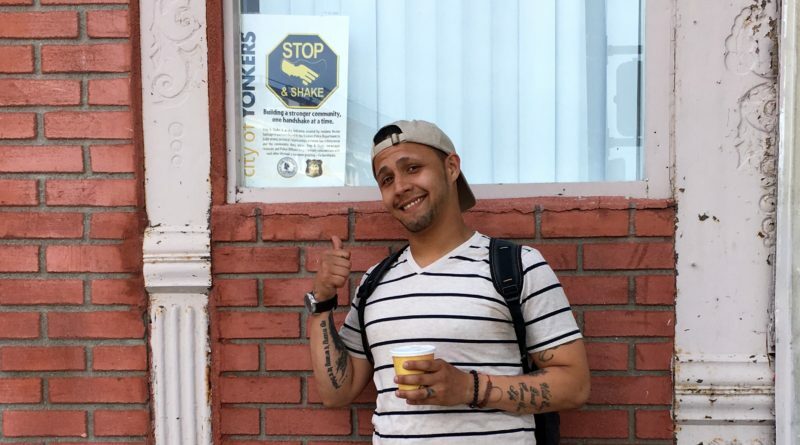 The 28-year-old Yonkers native, business owner, community activist, poet and reformed gang member is the man behind The Stop & Shake, an initiative that goes far beyond its initial goal to improve relations between residents and their local police department. The Stop and Shake has been an essential part of breaking stereotypes, Santiago told Westchester Woman. What other way can you actually break down stereotypes about people than by actually meeting them. Though we may have preconceived notions about someone based on their appearance, that can fall away when youre shaking someones hand and the person on the receiving end becomes just a fellow human. A human you already have something in common with, the city you live or work in. Stop and Shake isnt just a handshake, its a mindset. A way of life that brings neighborhoods together across class, race, gender, socioeconomic status and circumstance. It all started in 2014, when Yonkers urban community was angry after the police shootings of Mike Brown and Eric Garner, and were fed up with the local police departments stop and frisk tactics. The Yonkers Police Department knew it and were looking to prevent a situation in Yonkers like the ones that occurred in places like Ferguson. Santiago, who had been dubbed The Peoples Mayor by his peers, took hold of the situation and began discussions with the police and local community leaders. Santiago found that there was no denying the number of weapons Yonkers stop and frisk policy takes off the streets. So, he came up with Stop and Shake. Stop and Shake serves as a counterbalance to the stop and frisk. Police will Stop and Shake, then have a conversation with those in the neighborhood. Meeting those they serve in a non-criminal or emergency situation can help officers?see the young man on the corner as a student, father?or a person who works?at that place down the street. Santiago was putting the finishing touches on the program when Yonkers fully adopted The Stop & Shake program in February 2015. The first year it was the Yonkers Police Department chasing people down for handshakes, it was hilarious and a really good year for the police department, said Santiago. Now that the police department was on board, it was time for the community and local businesses to get on board. Youll find the Stop and Shake logo posted throughout Yonkers (they are in almost 200 businesses), along with pop-up Stop and Shake events. Stop and Shake also offers workshops on interpersonal communication, conflict resolution, anti-bulling, leadership and community organizing. With the Stop and Shake, businesses get to know the people in their communities and?neighbors to get to know one another. The old woman who is too scared to say, Can yall guys keep it down, just calls the cops, explains Santiago. ?With the Stop and Shake, she now knows her neighbors and isnt afraid to confront them. Now everyone wants to Stop & Shake. So, far Yonkers and Mount Vernon have adopted Stop and Shake, and New Rochelle and Peekskill will run their own programs the by end of the summer. Places like Oakland, Ferguson, Hastings-on-Hudson and ?a town in?Massachusetts are all asking for Stop and Shake programs of their own. Santiago is working on taking Stop and Shake to a national level once the summer is through. Some of these towns don’t have problems in their communities, they just want their communities to get closer and have more people come to their meetings, Santiago explained. It just makes sense. If youre wondering what someone is up to stop and say Hi or Whats Up to someone. Stop and shake, and find out. Stop by the next Stop and Shake station, sponsored by Fidelis Care, at How Sweet It Is candy shop at 979?McLean Ave. in Yonkers on Thursday, June 9 from 2 p.m. to 4 p.m. to enjoy treats, giveaways and good vibes.